Return of the YAK: New Album From You Already Know … | Scots Whay Hae! Times are often defined by the new, or at least the most prominently hyped, music that is around and it gives us a skewed version of history overlooking some of the great music made that doesn’t fit such easy, and lazy, categorisation. The same is true about the present day, with music that embraces a folk aesthetic, and the seemingly ever present ‘indie’ rock, being the current darlings of the music critics and Sunday supplements. Some of the protagonists are great, and have been celebrated on these pages, but focusing on one or two styles is not only boring, it stops people from discovering something they didn’t know they liked. I’m interested in the quality not the style, and, to paraphrase Mr Wonder, there is good and bad in every one. It is important that people know that there is a great breadth of music as well as depth. All tastes are catered for if you look hard enough, you just have to look harder for the bands who won’t be easily boxed. 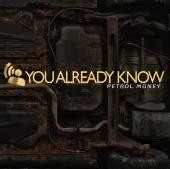 Which brings me to You Already Know, otherwise known as YAK, who are about to release their new album Petrol Money. They are a force of nature who don’t bother with pesky words, something more bands should seriously consider, and who make music that is heavy, melodic and which gives more with each listen. Think Explosions in the Sky without the quiet moments but with Killing Joke’s rhythm section and heavier guitars. This is riff driven rock, but with a musical sensibility that cannot be ignored. Songs such as Goliath, The Gush and Business Class have a real symphonic, rhythmic, quality that is almost hypnotic. If you want to catch YAK live then they are launching Petrol Money at The Cathouse in Glasgow on 22nd April where they will be joined by Bloodlunch and What the Blood Revealed. I haven’t seen them face to face as yet, but since the album was recorded as live I’ve a fair inkling it’ll be epic. See you there. Petrol Money is available to buy on CD or download from the 18th April. To learn more about You Already Know pop over to youalreadyknow where you can tune into YAK TV.